People who visit rural hometowns usually look for home cooked meals or local cuisine. But sometimes dining places with modern twists, like a fast food restaurant offering both American and local flavors, can add spice to your travel experience. One such place is the Biggs Diner in Legazpi City, Albay. Biggs Diner is a 50’s inspired dining place that offers classic American food like Burgers, French Fries, Pizza, Ribs, and Milkshakes. 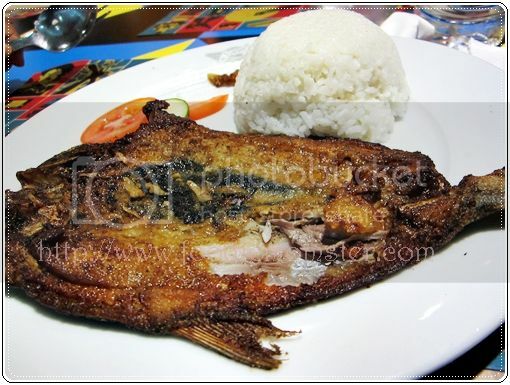 Once can also find local dishes like Daing na Bangus, Bistek Pinoy, and Adobo along with their western fares. 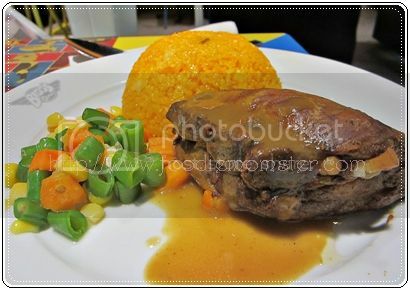 The interesting part is that some of their meals are laced with the spicy flavor which the Bicol Region is known for. I was tempted to try the Biggs Diner Extreme Chili Mushroom Burger that makes a perfect combo out of American and Bicolano flavors but I was really set on eating rice. My sister was ready for their burger but she doesn’t have the hots for the chili flavor. She got the Extreme Supreme Burger instead and I couldn’t help but start counting the calories when it was served. 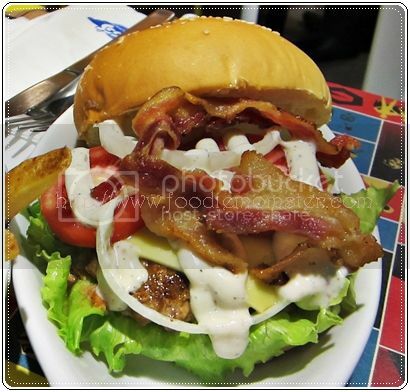 The combination of bacon strips, cheese, burger, and rich dressing is enough to make your mouth water. 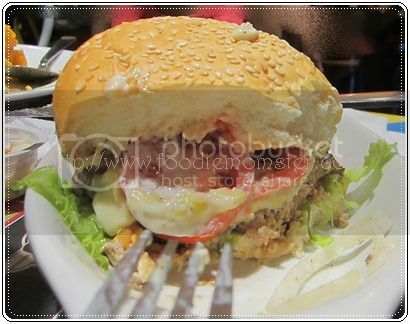 One could also see that the somewhat thick burger patty has extenders in it. It was a decent burger and my sister did not have any trouble eating everything in her plate but you’d still get the feeling that it could have been better. Some people may find these burgers enjoyable despite the extenders, but I would rather have the real deal in my burger even if I have to pay extra. Perhaps they could include a “Real Bigg Burger” in their menu with patties that are made from 100% beef. As for their rice meals, the Daig na Bangus was slightly toasted and could have used a dab of paper towel to remove excess oil. It was a good thing that the service was friendly and they do not scrimp on the table napkins. After removing the extra oil, our senior citizen companions got to enjoy their meal and finished it off as well. The Salisbury steak tasted good but the extenders could be an issue for burger lovers. 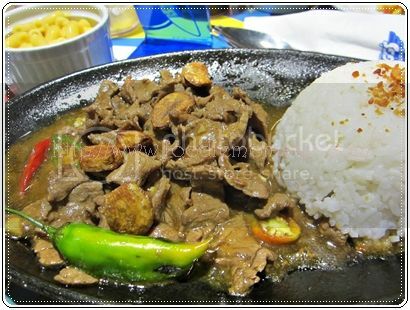 I got the Salpicao , a stir fried beef dish drizzled with sauce and topped with garlic chips and green chili. The tender meat and the hint of chili in the sauce made it easy for me to finish it off and mark it as a favorite dish. The Baby Back Ribs is another dish that is worth trying. It had flavorful and tender meat that you can easily pull from the bone, served with java rice, buttered vegetables and a gravy boat. And the best thing about it is the budget friendly price. 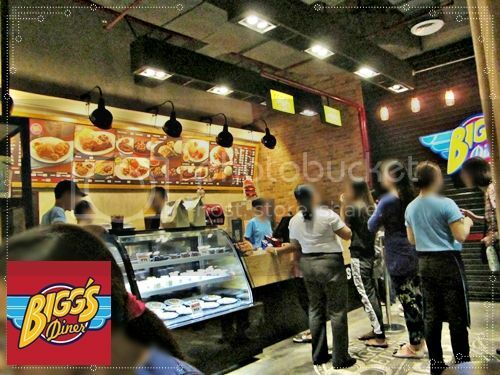 There are only a few restaurants in the Bicol region where one can get close to authentic American Diner Food, and this is where Biggs can outshine other fast food chains in the area. It was not an exceptional diner but the Biggs Diner Legaspi branch sure had nice interiors, pleasant ambiance, good service and value for money meals. I also liked the fact that they incorporated the chili flavor of Bicol in their menu. These reasons are enough for me to pay this joint another visit on our next trip to Legazpi, Naga, Camarines Sur, and Sorsogon.